Spotted over at designboom, OFL Architecture‘s Enoki Eco City is a fantastical, sustainable model for Rome. Possibly inspired by fungi sprouting up from the ground, the city is a series of criss-crossing towers with topped with pods coated in a shiny metallic surface to reflect the surrounding landscape. Envisioned to be a completely self-sufficient city with regards to energy and daily necessities, the city is an exploration of future urban possibilities. Encouraged by achievements in material science, energy conservation, aerodynamic and environmental solutions, OFL Architecture was able to dream up the sprouting cities in the sky based on knowledge of what is possible. Enoki Eco City is composed of a series of structural towers that rise up 150 stories over the landscape to sprout pods that contain the necessities for urban life. Elevators, which you would expect to occupy the towers are eliminated, and residents and guests are transported between the city and the top of the Enoki via flying shuttles. The small self-contained cities includes residences, commercial spaces, green areas, spaces for community activities, sport and cultural activities. 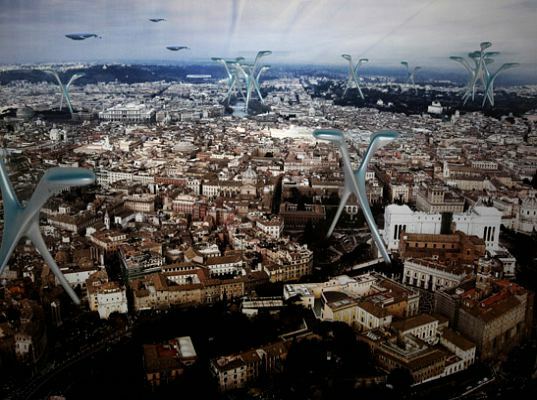 The exterior is “made with steel diamond-shaped panels, appropriately follows the main cellular structure of the enoki made from steel and glass, having a molecular shape.” Rome-based OFL designed the Enoki originally for Rome, but envisions that the eco city concept would be applicable for any major city, providing housing for 6,000 residents. @psybreaker We care because these things would look horrific. They do not blend into their locales and complement them: they destroy the local ambiance and sit out of place as alien artifacts in some of the most beautiful and ancient cities. We do not build giant shiny mushrooms in Rome for the same reason we do not build a suburban style McDonald's next to Machu Pichu. It is out-of-place, obtrusive, and destructive, for a place like Rome, Paris, or Machu Pichu is more than the buildings that are present which create an ambiance of romance or adventure: it is also what it lacking, namely the great, bulbous ignorance of 21st century design sprouting up in these renderings. Why are all these comments so negative and clearly from people that lack imagination? If you don't want to stretch your mind stick to the mainstream media fools. No one cares keep your lack of inspiration to yourselves. These buildings look like the Martian war machines from War of the Worlds. Why destroy the beauty of such a treasure as Rome? Better that they be considered for La Defence (Paris) or Brasilia. The whole idea is ludicrous. Yet again, another architect eschews good design, efficiency, and any attempts to blend buildings into the local environment, instead creating giant monoliths which are no doubt compensating for something the architect is lacking... It'd be nice to say the least if you guys could stop publishing pipe-dreams on this blog and at least vaguely consider the plausibility (or extreme lack there of) when writing articles. The environmental impact of constructing such a structurally inefficient form would offset any solar panels or other such silly installations at least tenfold over the life of the structure. Will architects ever learn!? Spotted over at designboom, OFL Architecture's Enoki Eco City is a fantastical, sustainable model for Rome. 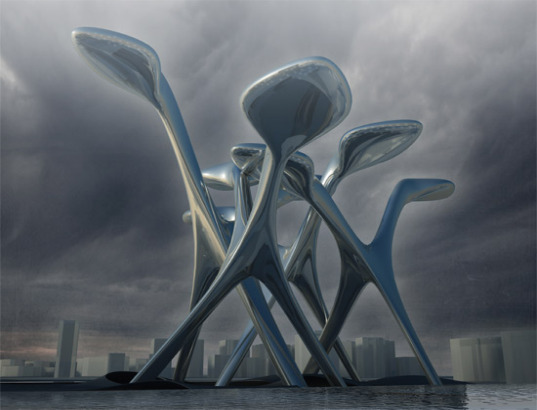 Possibly inspired by fungi sprouting up from the ground, the city is a series of criss-crossing towers with topped with pods coated in a shiny metallic surface to reflect the surrounding landscape. Envisioned to be a completely self-sufficient city with regards to energy and daily necessities, the city is an exploration of future urban possibilities.